As I walked away from Carrie Furnace, having spent the previous two hours touring this relic of Pittsburgh’s steel industry, I knew I had just been somewhere special. Without a doubt, Carrie Furnace is a microcosm of the changes that have occurred in Pittsburgh over the last few decades. What’s old is becoming new again. What was once polluted is becoming green. And what was industrial is becoming artistic. If you want to understand where Pittsburgh has been and where it is going, there is no better place to visit than Carrie Furnace. 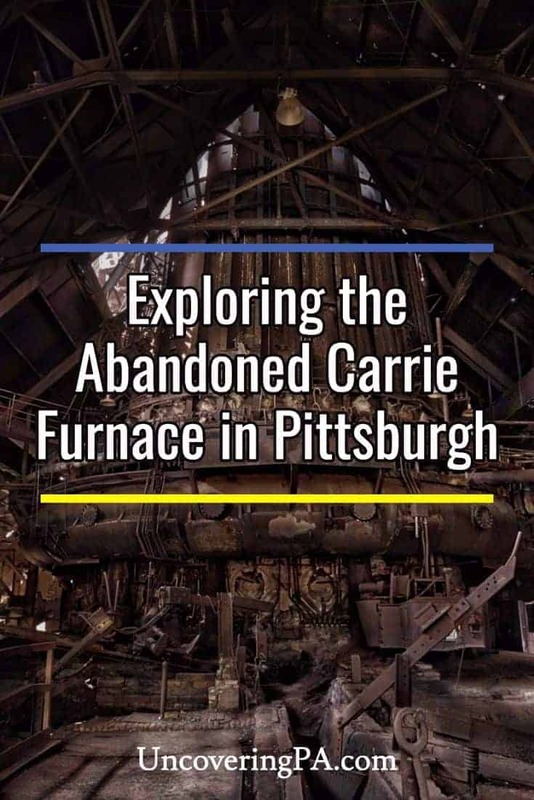 Located just outside the Pittsburgh city limits, Carrie Blast Furnace was once part of the Homestead Steel Works. 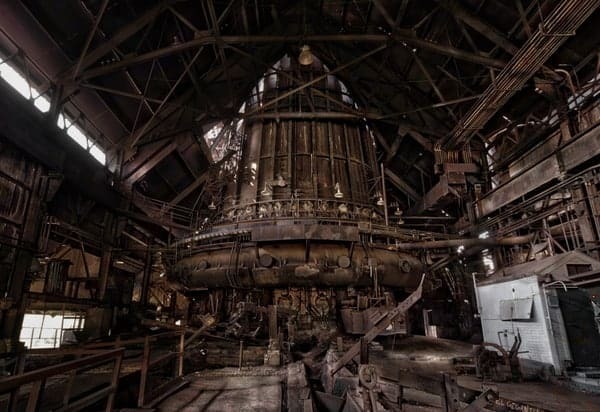 The two furnaces that make up the site were built in 1907 by Carnegie Steel and ran almost continuously until 1978. Carrie Furnace is the only example of a pre-World War 2 iron furnace left in Pittsburgh. Pittsburgh is known as “The Steel City,” and for good reason. At its peak in 1910, the steel industry in Pittsburgh produced more than 60% of the total production in the US. The peak period of production at Carrie Blast Furnace was in the 1950s and 1960s, when the seven blast furnaces here were each producing 1,250 tons of iron ore every day. During the 71 years of operation, changes were made to the blast furnaces, but they remained virtually unchanged after 1936. This outdated technology was one of the chief reasons that furnaces 6 and 7 were the first ones shut down when the complex began to shut down. It was also the reason that these were the furnaces chosen for preservation by Rivers of Steel National Heritage Area. Large equipment sits in the Carrie Blast Furnace visitor center. After years of work to preserve the site, tours of Carrie Furnace started running in 2010. Having seen photos of the site when planning my trip to Pittsburgh, I knew that this was somewhere that I had to visit. My visit started in the site’s visitor center. Currently, the visitor center consists of little more than a sign-in table and a small waiting area. 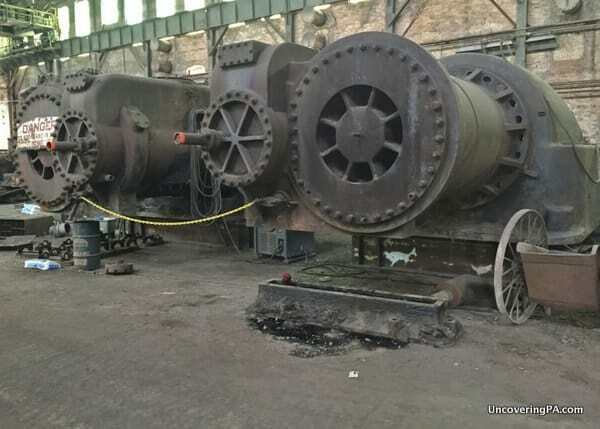 The vast majority of this very large building, which used to provide a massive amount of air to the furnaces, is used for storage for a variety of pieces of machinery and equipment that the site hopes to restore. If you look across the building, you’ll notice a large US Steel safety sign emblazoned with the three hypocycloids that have been made famous by the Pittsburgh Steelers. This US Steel safety sign can be seen in Carrie Furnace. Tours of Carrie Furnace take 1.5-2 hours and are often led by former steel workers. 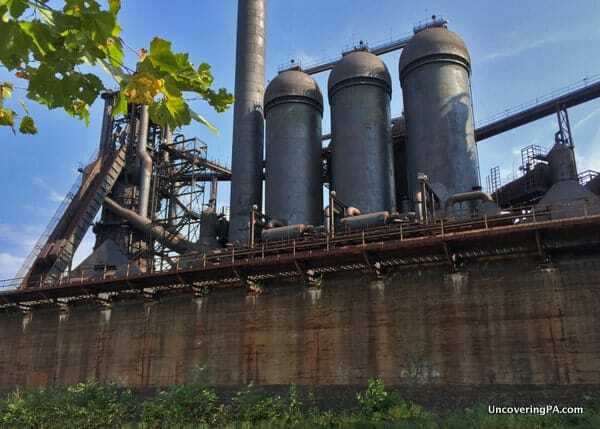 The tour takes visitors throughout much of the site, explaining the Carrie Furnace history, how iron was made here, and how that was turned into steel across the Monongahela River in Homestead. The highlight of any visit to Carrie Furnace is walking around the furnace itself and learning how iron was made. 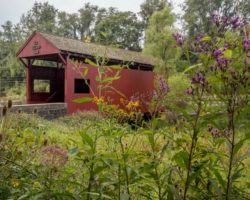 While certainly on a larger scale, the process of making iron had changed little since the 18th century iron furnaces I’ve visited in eastern Pennsylvania. The once-abandoned Carrie Furnace is a must-see for photographers. While the area has been cleaned up a bit, it is still quite rough around the edges, and really has the feel of exploring an abandoned site. Work continues on the site to improve access and make it safer for visitors. And while this is needed in places, I hope that it doesn’t take away from the very cool urbex feel of the site. Back outside the furnace, take note of some of the graffiti that is present at the site. It’s not surprising that a place like Carrie Furnace would have issues with graffiti, especially since it was sitting abandoned for many years. To combat this, Carrie Furnace works with the art community and allows sections of the facility to be used by graffiti artists. This cooperation has greatly reduced the amount of unwanted graffiti that occurs on the site and provides a wonderful artistic touch to the harsh metal of the furnace. This awesome piece of graffiti art features the Rivers of Steel logo. 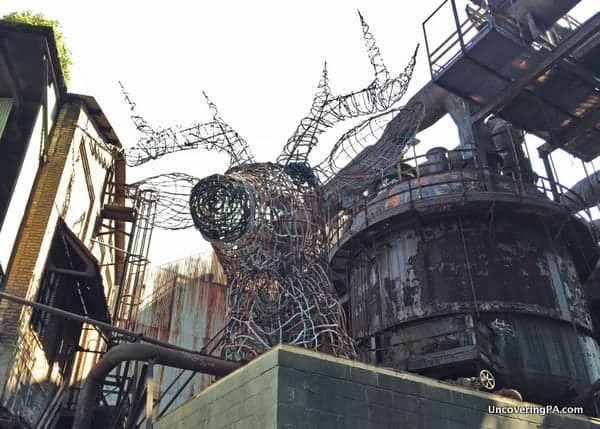 Another piece of art on the site is the “Carrie Deer.” Standing 45-feet tall and hidden amongst the structures of the furnace, this deer head is made entirely of pipes and other materials found on site. 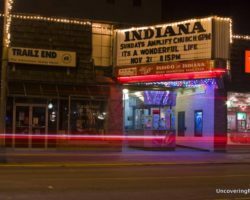 Constructed by renegade artists between 1997-1998, this piece of art has now been preserved and even has its own documentary. The Carrie Deer was constructed by renegade artists in the late 1990s. 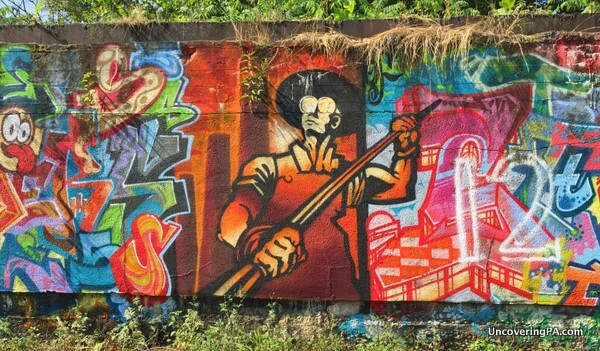 Those interested in the art and graffiti history of the site can take the Carrie Furnace Urban Art Tour, which covers more than 30 years of art. Carrie Furnace also hosts period art exhibits that are popular with visitors. Another interesting area is known as the Iron Garden. This area is located where furnaces 1 and 2 once stood. Since the land was used for heavy industry for nearly 100 years, the soil was deeply affected and heavily acidic. Minus some basic maintenance to maintain walking paths, this area has been left to grow back completely naturally. Ten different signs lead visitors through the Iron Garden and explain how nature is reclaiming the land. I found it very fascinating to see how plants are growing in this area despite the poor soil and large pieces of metal scattered throughout the land. I’ll be very interested to come back in a few years and see how this area has changed. 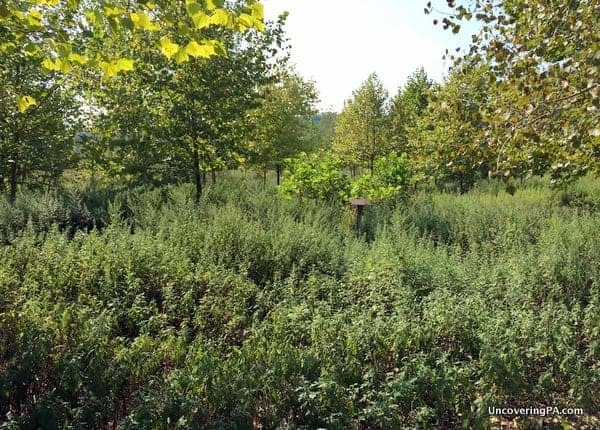 The Iron Garden has been mostly left to nature and is a great way to see how nature reclaims industrial land. The Iron Garden is just one example of the environmentally-friendly practices that have been worked into Carrie Furnace. The site also uses solar panels for electricity, goats maintain portions of the land, and waste is composted. 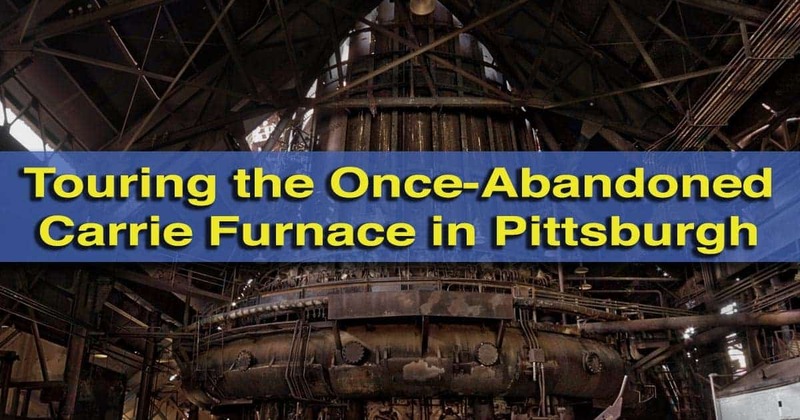 While the steel industry was blamed for so much of Pittsburgh’s pollution problems in the mid-20th century, it’s amazing to see the furnace leading the way in Pittsburgh’s green movement today. Awesome photographs are everywhere you look inside Carrie Furnace. I really can’t express how awesome my visit to Carrie Furnace was. 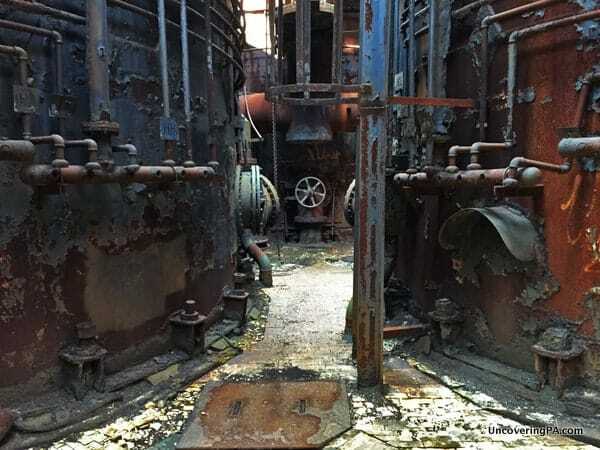 Whether you are interested in Pittsburgh’s industrial history, love exploring abandoned places, consider yourself an art aficionado, or just like taking awesome photos, put a tour of Carrie Furnace at the top of your must-do list. Carrie Furnace is an industrial site and is still far from pristine. My trip took me up shaking stairs, past rusting metal, and over equipment that hadn’t been moved in decades. All visitors are required to sign a waiver before touring the site. It’s also worth noting that Carrie Furnace is not handicap accessible and only closed-toed shoes are allowed on the tour. Given the nature of the tour, it is not recommended for children under eight. If you want to learn more about the area’s history, Carrie Blast Furnace is just across the river from the site of the Homestead Strike of 1892. 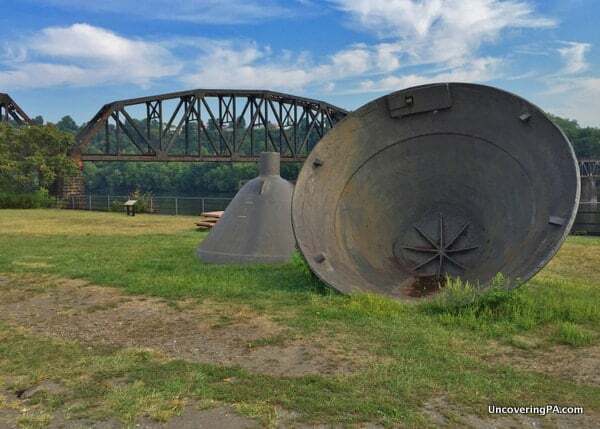 Tucked between the river and a large shopping center, the site features the old Pump House, a large water tower, and several pieces of equipment scattered on the ground. The area around the Pump House was the site of the Homestead Strike in 1892. 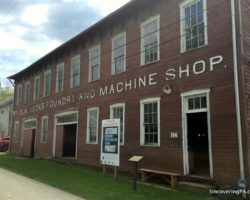 It was on this site in July 1892 that a battle ensued between striking workers and forces brought in by Carnegie Steel. Several signs on the site tell the story of what happened here. Also nearby is the Bost Building, which serves as the Rivers of Steel Museum. Further afield is the W.A. Young and Sons Machine Shop and Foundry in Rices Lading. Note: My tour of Carrie Furnace was hosted by Rivers of Steel National Heritage Area. However, the opinions expressed are my own. Spending more time in Pittsburgh? 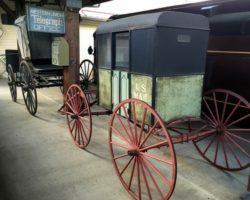 Learn about the city’s history at the Heinz History Center, enjoy food and drink at Pittsburgh’s breweries, or visit the best photo spots in Pittsburgh. Thanks for sharing – I’ll have to check this place out. In addition to the deer, there also was an enormous owl that was created inside one of the buildings… Unfortunately, it had to be dismantled by one of the crews that was brought in to work on the place. Both were the partial works of Tim Kaulen, Pittsburgh sculptor. Interesting. I hadn’t heard that, but I know that they had to remove some of the art in order to preserve the site itself. Jim, that looks like a place I could spend days! I’ll certainly plan a visit next time I’m out that way. One quick technical note, from paragraph four: this mill would have consumed 1250 tons of ore, or produced 1250 tons of iron, but it wouldn’t have produced iron ore, that comes from the ground! Thanks again for some great reading. I was going to point out that the seven blast furnaces “processed” 1250 tons of iron ore per day, not produced…but I see that Jeff beat me to it. I’m going to have to take a trip and see these furnaces. Once a Blast Furnace Man always a Blast Furnace Man. Hard to explain…….probably the only others that would understand were those who worked on Furnaces.